Protocol was well and truly flouted on the latest leg of the royal tour when a five-year-old boy touched Prince Harry’s beard. The Duke and Duchess of Sussex are touring Australia and New Zealand after announcing they’re expecting a baby. Five-year-old Luke Vincent was allegedly mesmerised by the duke’s facial hair because his “favourite person in the world is Santa Claus”. Luke’s teacher said he “didn’t give [Harry] any choice” in the matter. The royal couple were touring Dubbo, in New South Wales, where they met volunteers from the Royal Flying Doctor Service and unveiled a new plane to mark 90 years of the organisation. During a tour of the city they also visited Buninyong Public School where they met Luke. 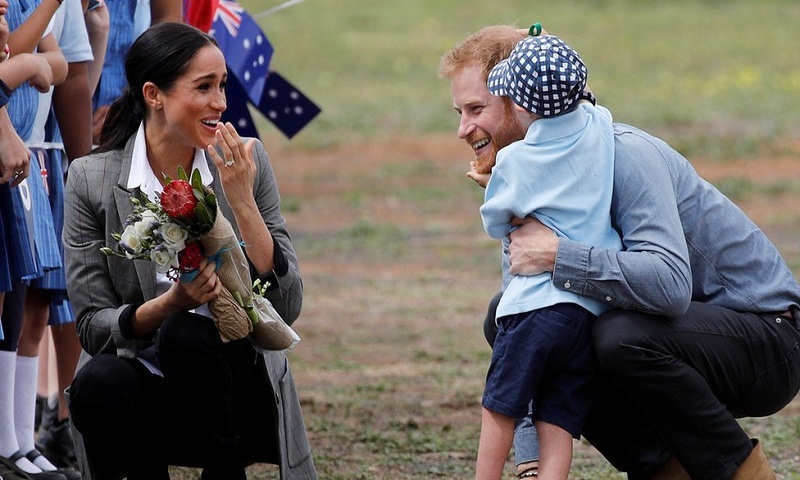 School principal Anne Van Darrel said: “He got a hug from Meghan and then Harry bent down to speak to him and Luke didn’t give him any choice. The Duchess of Sussex showed off her culinary skills and generosity by baking some banana bread for tea on the Woodley family farm outside Dubbo. Hello! magazine’s royal editor Emily Nash said the banana bread was “rustled up last night in the kitchen at Admiralty House” in Sydney. Pru Leith and Paul Hollywood weren’t at hand to assess whether it had a soggy bottom, but the Daily Mail Australia reported that the “royal recipe contained chocolate chips and a bit of ginger”. Emily Carroll, a member of the Woodley family, said she spoke to the duchess about her pregnancy. The duke and duchess discussed the drought which has been affecting the region with the Woodleys. “They understood how we have been forced to sell so much stock, all of our breeding ewes, and how prices for grain have gone through the roof,” Scott Woodley said. However, the heavens opened during the royal visit, pelting the crowds with heavy rain and hail. Prince Harry battled the elements to thank the hundreds of residents for “welcoming me and my wife so warmly, and wet today”. Meghan tried to protect him from the worst of the rain with an umbrella, to no avail. He said being in Dubbo “brings back memories of 2003, when I spent time jackarooing [working] on a small 16,000 hectare property” in Queensland. On Wednesday the duchess wore a less formal ensemble of Outlander jeans, J Crew boots, and a shirt by Maison Kitsune. She also wore a checked blazer from her friend Serena Williams’s fashion label. The tennis star was quick to post matching pictures of the pair in the same jacket.